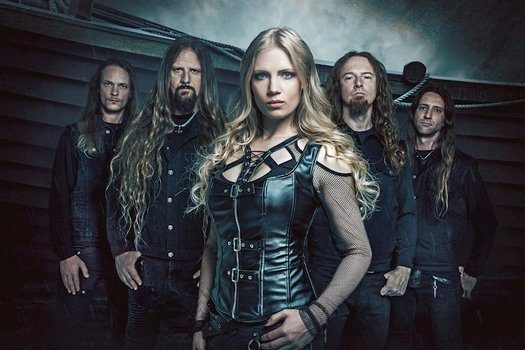 After acquiring new vocalist Elina Siirala back in 2016, Leaves’ Eyes quickly set sail across the world to showcase their invigorated spirit. With plenty of live energy pooled from their collective experiences, they dove into the studio in 2017 as they had only released one EP with Siirala at the vocal helm (much of the recording process done in between two North American tours). The band’s seventh studio album, Sign of the Dragonhead sees renewed fire from the act, as they continue to expand and diversify their sound. With an exciting new record to discuss, we were able to have a Skype chat with vocalists Alexander Krull and Elina Siirala, as well as guitarist Thorsten ‘Tosso’ Bauer one Saturday afternoon in December. Topics ranging from details of the recordings to lyrical concepts and orchestrations/choirs all can be found, as well as Krull’s involvement with the Jomsborg Viking scene, what the band members like to do for fun, and what we can expect from them in 2018. Dead Rhetoric: First off, congrats on Sign of the Dragonhead. It feels like it may end up being your strongest effort to date. Alexander Krull: Thanks a lot! We agree [laughs]! It’s the biggest Leaves’ Eyes production, that’s for sure. Dead Rhetoric: Definitely – you can hear all the different layers you have going into it. Krull: Exactly – our goal was to have layered music but not in that it overshadows our wonderful musicians who are taking part [in Leaves’ Eyes]. The choirs, the orchestra, the arrangements – they are all to help to create a diverse album. That was the goal. Dead Rhetoric: Do you feel this is the culmination of all the work that’s been done in the last two years since Elina [Siirala] joined the band? Krull: You always want to give the best you can, but in this case it was certainly like that. We had new possibilities with Elina. We had a great experience working together on the Fires in the North EP, which was really cool. It was also nice to have those tours and bring all the live energy back into the studio. For me, it was literally jumping out of the tour bus and into the plane. Then we went from the plane into the train, and then hit the studio. It was a rollercoaster, with a lot of live adventures and studio adventures. Dead Rhetoric: So do you feel that live energy carried over into the album, since there was really no downtime in between? Krull: Absolutely. It was in between our tours with Sonata Arctica and Sabaton that we had studio time, and afterwards as well. Actually, the album should have been released already (in autumn of 2017). But when we arrived in the US for the Sonata tour, we had a phone call that we would be on the Sabaton tour and to be prepared. So we had to talk to the label. They said [the Sabaton tour] was a great opportunity, and we said that we would not be able fulfill the studio schedule, so we decided to push the release back until January. It was all for the good, I have to say. Literally, you come from the tour and you still had the stage feeling inside. Then you are listening to the songs, you record, you write new parts and add vocal lines – you have that [live] experience and you want to bring it to the new album. You also have the great feedback from the fans [on the road]. 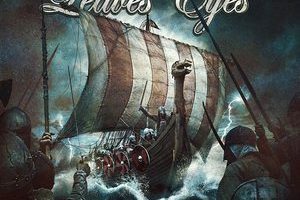 Dead Rhetoric: Each Leaves’ Eyes album seems to have gotten more expansive and diverse – what strikes you about Sign of the Dragonhead? Thorsten ‘Tosso’ Bauer: We pushed forward the symphonic elements on Njord, and the folk elements on Meredead. I think we already had a huge production on King of Kings, but I think this time we took what we learned from the previous ones. This time, the star of the album are the songs. I think that with all this knowledge and experience, we were able to give the songs what they needed, and it felt like we had 6-7 songs that could be a single. I think that’s the strength of the album. To have compact and precise songs, that immediately strike and stay in your head. They are very symphonic but at the same time they are very catchy, with easy melodies. Dead Rhetoric: I would definitely agree there – you already released the title track, but as I was listening to it, I kept wondering which song would be released next because at least half of them would work really well. Dead Rhetoric: As long as we are talking about “Jomsborg,” Alex, could you talk about your personal connection to the song? Krull: We had this idea to write about this wonderful saga, and the legend of Jomsborg. There are two personal things connecting to this, besides it being an awesome story to tell about this mercenary Viking group where the guys were forced to leave their home and lives to join the brotherhood itself. 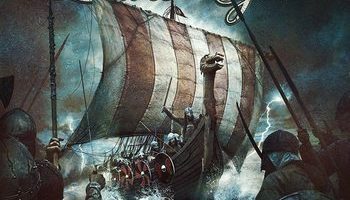 There were fields all over the Baltic Sea, and an unbeatable army – 300 ships. The saga is amazing. But that was not all. It was really personal as well, because my father’s family comes from that area where the saga was born. Also, nowadays in the Viking reenactment scene, it’s very strong and the biggest group is the Jomsborg Army, and I am part of them as well. I am a member of honor. These guys are also trying to assemble in the States as well – they come and support us. Other Vikings support us on stage in Europe too. We also were able to film the new video clip for “Sign of the Dragonhead” at the Oldenburg Wallmuseum with the Jomsborg Elag Starigard. Of course we also had to record some stuff for the “Jomsborg” song also at their place – it was great fun! Dead Rhetoric: Leaves’ Eyes always puts out some epic videos to accompany the music, do you view them as natural extensions of the material? Krull: It suits very well with the sound and mission of Leaves’ Eyes. We want to have everything organic, everything hand-made. It’s like with the Viking reenactment – they also reproduce everything with authentic looking material and replicas. We try to reproduce a real and Viking atmosphere, even though we don’t know how the music sounded…probably not with electric guitars [laughs]! But as much as we can, as a metal band, we want to combine elements like big drums and percussion, a pagan instrument like the harp, or fiddles and Celtic stuff – it creates this outstanding atmosphere and a great vibe within our music. Dead Rhetoric: For the remaining songs, could you go into the themes and lyrical content? Krull: I think it’s very important for a band like Leaves’ Eyes to not only write about battles and swords – there’s much more behind the Norse mythology. So we decided to write about other topics. It’s not a concept album like King of Kings, although Sign of the Dragonhead actually starts where King of Kings was ending. The Dragonship of King Harald is a big part of it when the album starts. The Vikings start to travel to new territories and new horizons. Some did by force, because they were hunted by their new king. On the other side, we wanted to include something like “Völva,” which is about the strong women, and the role of women in Viking society. The female seers, which you would later call witches, or something like that – for the Viking society, it was important for all the leaders to have advisors with connections to the Gods or the otherworld and foresee the future. We liked the mystical topic, and wanted to include it in the Leaves’ Eyes sound. It has an important role here as well, like the Viking stuff in general – nature, the ocean, and landscapes…this is another side of the story. The mystical side and the world of Gods, and I think it suits very well with our music. Dead Rhetoric: So does that authenticity play a huge role at this point? To make sure that everything is as authentic as you can be? Krull: We are history nerds on one side, but it shouldn’t overthrow the music…we are a metal band. But it’s great to have these topics. We’ve heard from some of the modern Vikings, and they are very proud that we are going into details and the depth of the sagas, and not just writing fantasy lyrics. It’s not only about Vikings though – the medieval times, and things like that – we’ve done other legends and cool stories, and more personal lyrics as well. But it was really cool that we could enter the long ship, sail to new horizons with the band, and give the fans a new opportunity to join the journey of Leaves’ Eyes. Dead Rhetoric: In regards to new horizons, now that you have Sign of the Dragonhead, do you feel that you are in a new point with the band with Elina as the singer? Tosso: Musically, we have moved a bit in a new direction from the Njord album on – we got a bit more symphonic and it was a little compromised. Liv [Kristine]’s voice was more known for it’s angelic and melancholic sound. Now we have the possibility for the music to be more powerful due to Elina’s voice. It’s just fantastic. Elina Siirala: For me, it’s great to have a new album that is fully recorded with me. I was able to be involved in the pre-production, so that the keys suited my voice. So it’s a great feeling to have a full-length coming out. Dead Rhetoric: Leaves’ Eyes uses professional orchestras and choirs. Do you feel that ‘you get what you pay for’ with going all out with these groups? Krull: The artistic aspect is always on top of everything. Of course, if you want to work with great, professional musicians – it will not be a cheap thing [laughs]! But yeah, if we have the chance we do it. We do it for the band, and the whole atmosphere. If we had to be more flexible or the budget was too tight, we would always find a way ourselves. We work together with people who are maniacs like ourselves who would like to participate on a project like Leaves’ Eyes. But of course, we are really proud to use the London Voices again, who worked on Star Wars and The Lord of the Rings. They have also worked with Queen, Paul McCartney and Pink Floyd. The first metal band they worked with was Leaves’ Eyes, and that’s amazing. Dead Rhetoric: What defines Leaves’ Eyes, with now seven albums under your belt? Tosso: I think that where we found our identity was the Symphonies of the Night album. We increased the production because we have this ambitious goal, as Alex already said, to have everything very natural and hand-made, because we think it has more of an emotional impact, and resonates with people. Hand-made, human-played music. I think with this album, we were able to bring it to a new level with the songs. I think that’s the biggest impact – we have the identity and the songs. I don’t know another band that has a song like “Waves of Euphoria” and “Riders of the Wind” with “Sign of the Dragonhead.” I think we have found our own identity. Dead Rhetoric: Between having Elina involved with Angel Nation, and the rest of the band with Atrocity, are you looking at a very intensive 2018? Siirala: Yeah – we have individual bands with their own identities, and we all enjoy being involved with different things. Of course, sometimes things are busier and it varies…but next year, definitely yes. It’s going to be very busy [laughs]. There’s no question about that. Even though you can say that we didn’t play that much live this year, we did the whole Sabaton tour, so it was quite a lot. This year was more about studio work and recording, and next year will be a lot more on stage. Dead Rhetoric: Did you ever think, just for fun, to put all three bands together on a tour and just go? Siirala: [Laughs] Yeah, of course it would be fun, but in reality, I don’t know if it would be possible because for me, I would be singing twice. Maybe for some amazing one-time thing, it could work, but for a tour I would definitely die [laughs]! Dead Rhetoric: Outside of music, what’s one thing that each of you really enjoy being able to do? Siirala: I love eating [laughter]! It’s a joke but not really a joke. Siirala: I don’t really have time to have specific hobbies but I try to keep active. Since I was a kid, I’ve been athletic and tried to take care of my health, which is sometimes challenging with these schedules. But for relaxing, it’s just normal things. I’m a sugar-addict, so I do love chocolate. But also reading – I do like reading and sometimes watching television. Tosso: I love to be in nature. Especially the forests or the mountains. I love historic places. Anywhere that has a story, I am always excited. When we played in China, I hated my own band except Alex…and Elina wasn’t there, but we were in the Forbidden Town and everyone was rushing through. I thought, “What the hell are you doing? I want to experience and learn about this place.” Everyone was rushing and I was so pissed at my own band. I told them next time I’m going on my own! Tosso: It was so disappointing – but yeah, historic places are always exciting for me. Siirala: I actually really do like nature as well, but in London it’s a bit more challenging. There are some great parks though, I do like going to the parks. I miss that the most from Finland – forests and nature. Krull: For me, you can just add on the trainings with the Vikings and the reenactment scene. Going to those events means a lot to me – we camp there and we get to experience the living history. Number one, of course, is to do great stuff with my son Leon. We go to soccer games, and do some Playstation action. He’s a teenager now, so it’s great! Dead Rhetoric: We are almost at the end of 2017. Was there any music you particularly enjoyed? Siirala: To be honest, you always come across new music, but for me, I don’t listen to it so much when I’m home because I have an overdose from work. But I come across older music through my students. You hear this song and it’s amazing, and then you find out that it’s a very old song that you should know. One was After Forever’s “Energize Me,” which I just found recently. But yeah, there are loads of bands – I really enjoyed watching Sabaton and Battle Beast when we were on tour together. It’s always nice to see bands live as much as you can. Krull: I found out about this Danish band called Heilung – they only use natural instruments. A little bit in the way of our songs like “Rulers of Wind and Waves” or bands like Dead Can Dance. I heard they got signed by Season of Mist and I think I’ll check them out more. I know their A&R guy, and was already sending congratulations for signing those guys. It’s really cool stuff! Tosso: Like Elina, because we were working on the album so much, sometimes it’s just nice to have silence. When you work all day on music – it’s very nice. But if I wake up in the morning and I’m a bit grumpy, then I listen to the best of Tom Petty. It always puts me in a good mood. Krull: That’s very metal of you, Tosso. Tosso: It’s not very metal, but it’s the truth. Dead Rhetoric: I know you have release parties coming up. Any solid plans besides those, going into 2018? Tosso: We will start with three release shows here in Germany – the 11th, 12th, and 13th of January. Then we will head on a European tour together with two other awesome bands in April and May. We’ll play some summer festivals in Europe. Hopefully then, we can hope back to the States. We still have a valid work visa, so I hope we can make it in 2018. If not, it will be 2019. But we would prefer to do it in 2018. Krull: I’m sure it’ll be 2018. Rise the hopes high!